It is the Fall again and time to scan and photograph the ever increasing pile of Stonehenge postcards and collectables collecting here in the cave. When out of the blue comes a Twit from Clonehenge about to my StonehengeCollectables gallery. A quick inspection of her blog proved to be a joy. I look forward to becoming a regular contributor to it. Needless to say, it fired me up and here I am trying my hand at Blogging again….. Is there anyone out there reading these Mutterings…. My first submission to Clonehenge was gracefully accepted and quickly posted, in thanks I have sent her a postcard commemorating its Six Druids award . My current plans for the Stonehenge Gallery upgrade include adding a new item, create or cleanup at least one album every day until I get caught up with the backlog of the acquired but not yet documented stuff. This includes stuff lost on shelves and collecting in corners around here. I will post to Clonehenge images of some stuff I have, well how can I say it, that are not truly a Stonehenge collectable but most definitely meets The Rules of Henginess. Til Later … off to create new a few and fix some links …. Welcome to yet one more corner of my little world. First let me try to explain how a “Bloody Yank” like me got so interested in Stonehenge to become an avid collector. My name is Bob Bradlee aka PostcardBob and formally known as the Cave Mutterer. One of my early Mutterings on the subject of Stonehenge “The Birth of a Collection” was first printed in the “Heart of Ohio Postcard Club Newsletter” and went on to become the seed that started the StonehengePostcards.com website. Over time, the collection expanded to include stamps, coins and other items and I had started StonehengeCollectables.com by the time it had become a full fledged obsession. My interest in Stonehenge began as a young boy in the 50’s. I remember my Grandfather telling stories about his adventures in England when, as one of the first Americans to be sent to England to assist the RAC during WWI. While on leave from hospital, he went by train to visit Stonehenge. He told a wonderful story about the stones that captivated my young mind. 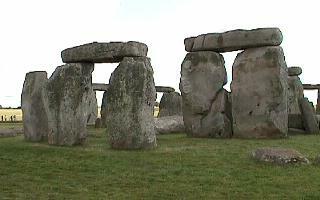 A father went to England numerous times in the 60’s and 70’s, visiting and photographing Stonehenge on several occasions. I followed the restoration process of the late 50’s and 60’s in the publications of the day and I even did a report for school based on the June 1960 National Geographic story and pictures. Stonehenge became a topic of conversation again in the 90’s while working with MrBill, my eclipse chasing friend. Following his return from Stonehenge 2001, he transcribed a nice muttering about using Stonehenge to predict Solar and Lunar Eclipse events called “The Stonehenge Eclipse Calculator” and can be found on the Eclipse-Chasers.com website. It was not until my visit to England in 1998 that I became aware of how commercialized Stonehenge, well much of England for that matter, had become over the years. Then again, show me one city, place, or thing of importance that has not been nearly consumed by commercialism at some point in history. I was amazed at the number of collectibles that were being sold to the masses. Seemingly everywhere there was another gift shop selling trinkets to the tourists. On the bus ride to Stonehenge, I had listened to the tour guide make a pitch about everyone being sure to stop in the gift shop, either before going through the tunnel out to view the stones, or before heading back to the bus or caravan as they called it. I surmised from the talk, the two hot items were: To squash a set of pennies and to mail a postcard home to yourself or family with a Stonehenge postmarked on it, or as they called it “Franked” from Stonehenge. It could be posted right there at the gift shop. When I saw the crowd all descend on the little gift shop, I beat feet and I left the group far behind. Some listened to the Guide droll on about something I should have listened to, but didn’t. As far as I was concerned, I was there for one thing – get some pictures. Which I did, using both an Olympus OM1 35mm and an early Sony Digital camera. Although I never got around to scanning the 35mm stuff, I did post some of the better Digital images taken with the Sony on the family website. Upon exiting the tunnel, I knew I was in a special place. It was a quiet day. We were the only group there at the time. I kept moving, so I could keep the others in shadow on the other side of the circle as I looked for angles and took my pictures. I never made it to the gift shop and have spent thousands of dollars on eBay over the years in retribution for that oversite on my part.